Sanitary Solutions is THE GO-TO SOURCE for sanitary stainless distributors servicing the Bakery, Beverage, Brewery, Cosmetic, Dairy, Food and Winery Process Industries. Sanitary Solutions has (7) seven warehouses of Sanitary stainless steel flow control products in one location in West Columbia, South Carolina to service and ship to the location of your choice the day you place the order. Sanitary Solutions offers LATE PICK-UP HOURS from UPS®, FedEx® and a national truck parked in front of our warehouses for daily pick-up to meet those late afternoon rushes that have to ship via truck! 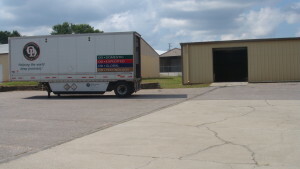 In fact, we have several national freight carriers that we contract with who offer two day service or less east of the Mississippi to meet your time demands. When you call Sanitary Solutions and speak to one of the team members, we will give you the undivided attention that you deserve, address your needs and provide you the necessary sanitary solution to your problem. The staff at Sanitary Solutions takes one call at a time, your call, before they go to the next call and addresses your needs before the call is finished. We send you an e-mail tracking and faxed confirmation for either quotes or products purchased that day so you can alert your customer promptly. Our warehouse team ships product that is capped, bagged, stamped with the size, alloy, heat number and bar coded with our logo along with a tracking number to the e-mail of your choice so you know the product shipped that day the way you wanted the product to ship. We have partnered with distributors throughout North America who share the same philosophy that Sanitary Solutions supplies quality products backed by competitive pricing. Furthermore, Sanitary Solutions is distributor driven and will not sell your customer so if an end user calls, the Sanitary Solutions team will refer the end user to our nearest distributor to service and let you know that they called us.